There’s actually an exciting slate of Thanksgiving Day football games this year! Well, sorta. Lions-Packers would be a monumental tilt, but with Aaron Rodgers almost surely out with his broken collarbone, the Packers will have to turn to Matt Flynn for a spot start against the Lions, who seem to find new ways to beat themselves on a weekly basis. The Raiders will bring Matt McGloin, roughly the football equivalent of a student film with potential, to Dallas to take on the Cowboys, who are starring in the big-screen adaptation of the story of the Lions. And then, at night, we get a game that should have playoff energy between two teams that shouldn’t be allowed anywhere near the playoffs in their current shape, the Steelers and Ravens. Squint and you can see five — maybe even six if you’re a McGloinomaniac — teams with legitimate playoff hopes. Put your glasses on and you see six teams capable of playing brutally ugly football. Thanksgiving is a time to be thankful. We’re blessed to have three football games to break up the monotony of talking to family members and eating. So let’s not come here and bury six football teams whose games leave us wanting; let’s celebrate them. Here’s a whole list of things to watch for and enjoy during tomorrow’s Turkey Day action. 2. Matthew Stafford’s sidearm throws: Once the product of so much frustration, the young Lions quarterback has managed to find a better balance for when to use his quicker release. By trading on his seemingly endless arm strength, the sidearm throws get Stafford out of trouble when there’s pressure on him, allowing him to find impossible angles at which to complete one of Detroit’s many screen passes. As a result, Detroit is one of the best screening teams in the league and Stafford never gets sacked; despite an inexperienced offensive line, Stafford has been sacked on only 2.9 percent of his dropbacks this year, the lowest rate in football among starting quarterbacks. 3. 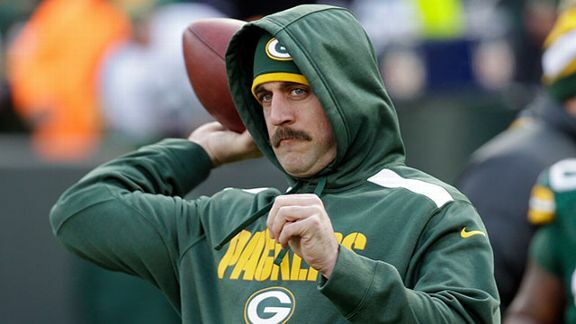 Aaron Rodgers’s mustache: Look at that thing. It’s like he’s somehow a 1980s baseball player and third lead on a cop show at the same time. The great thing is that Rodgers doesn’t have the mustache in most (all?) of his commercials, so you know that each offseason he has to shave the thing to get paid, hates that act, and then can’t wait to grow it back during the season. Rodgers has explained his concerns about a full-time mustache before, but shouldn’t we be at the point as Americans where we’re OK with Rodgers having a mustache in a pizza commercial? I like to think we are. Bonus points for your uncle who uses Rodgers’s mustache as an excuse for any of his own facial hair misadventures in the past. 4. Eddie Lacy’s power running: We all love to be right as fans. As frustrating as it is to complain about something that’s missing from our favorite teams for years, there’s nothing more satisfying than the team finally doing what we thought it should and having that actually work out, right? Packers fans have to be feeling that after years of crying out for a viable starting running back and coming up with Lacy, who has looked better than his 4.1 yards per carry this year. Rotating running backs and situational usage patterns are rightfully the wave of the present (and future) around the NFL, but it must be enjoyable for Packers backers to have a runner who doesn’t need to come off the field in certain situations so the team can hand the ball to John Kuhn. 5. The Matt McGloin era: Sometimes, though, being wrong is fun, too. I thought McGloin was basically Oakland’s way of throwing in the towel on an occasionally competitive 2013 in an attempt to refocus its efforts on tanking for a high pick in the 2014 draft. Then again, I thought that about Terrelle Pryor, too, and I’m now running 0-for-2 on Oakland quarterback choices this year. Just as Pryor was surprisingly impressive before suffering an injury, McGloin has now exhibited shocking coherency during his first two professional starts. He’s only completing 55.7 percent of his passes, but McGloin has averaged nearly seven yards per attempt, thrown four touchdowns against one pick, and been sacked less frequently than Stafford (although he doesn’t qualify to lead in any rate statistics because he has played in only three games). The truly interesting thing about McGloin is what his success suggests about young quarterbacks. If McGloin can put together a competent half-season for the Raiders, he would be one of the first undrafted free agents in the history of the league to pull that off during a true rookie campaign. And like Tampa Bay third-rounder Mike Glennon, McGloin’s success in the pros has been either consistent with or better than his level of play against much inferior competition at the college level. Even as Colin Kaepernick and Robert Griffin struggle through difficult second years as starters, the success of guys like Glennon and McGloin show us that the level of play from college quarterbacks is higher than it has ever been before. And, likewise, that suggests teams should be more aggressive about moving on from expensive, middling veterans to go for younger options. If McGloin throws four interceptions against the Cowboys … just pretend you imagined this paragraph in a tryptophan-induced dream. 6. Oakland’s famous defense: Oakland’s defense isn’t as bad as you think. It’s 23rd in DVOA and 20th in points allowed per game, but those numbers are inflated by two ugly performances against the Broncos and Eagles; the Raiders have allowed 24 points or fewer in each of their nine other games. That’s not to say the awful games don’t matter, but Oakland’s defense has given the team a chance to be competitive in the vast majority of its matchups. That’s a display of competency, if not brilliance. 7. Tony and Dez’s day of the year: Two things are true: Everybody has an opinion about Tony Romo and Dez Bryant, and it’s harder to express those opinions with a turkey leg in your mouth. Hooray for Thanksgiving! In all seriousness, getting to watch Bryant play against a team that has no cornerback capable of shutting him down is a treat. Oakland has a sound run defense, but it allows opposing no. 1 receivers to average 80.1 yards per game, the ninth-largest total in the league. Thursday should be an opportunity for Bryant to get past the ridiculous national arguments about his sideline demeanor a few weeks ago with a dominant game in front of a captive, sleepy audience. One exception: If the 16 yards Bryant took away from your cousin’s fantasy team caused him to lose his matchup last week, you will regret ever having a family, caring about football, or playing fantasy football. Nobody likes fantasy football bad-beat stories, let alone being stuck listening to them for hours. 8. Jason Hatcher: A player who was ticketed to have a breakout season since about 2007 or so, Hatcher is a useful rotational lineman who dates back to the Bill Parcells days in Dallas. (To contrast, the guys the Cowboys took before Hatcher in the draft were Bobby Carpenter and Anthony Fasano.) Hatcher was never a clean fit in Dallas’s 3-4 alignment, but he has excelled as a 4-3 defensive tackle capable of penetrating through gaps and making plays in the backfield. He has nine sacks in 10 games, a staggering total for a 4-3 tackle, especially if he stays on pace and finishes the year with 13.5 takedowns. The last time a 4-3 defensive tackle had that many sacks in a single season was when La’Roi Glover pulled off the feat for the 2000 Saints. The only problem? Just as Hatcher gets good, he might be too expensive for the Cowboys to retain. Hatcher will be an unrestricted free agent next season and will surely command a huge raise over his $2 million salary from this season. Dallas, as I wrote about earlier this year, is already over the salary cap in 2014 and will need to make cuts to get underneath, let alone give anybody else new raises. It seems likely that 2013 will be Hatcher’s last Thanksgiving in a Cowboys uniform. 9. The fact you’re not the one paying Joe Flacco more than a million dollars per game: If Flacco were to realize the entire $120 million contained within his six-year contract, he would be paid about $1.25 million per game. As is, it seems sure he will at least play out the first four years of his contract, which would result in Flacco receiving about $1.1 million per game over each of the next four seasons, with about $30 million of the $70.5 million he’ll receive over that time frame already in Flacco’s bank account. 10. The fact you’re not the one paying for Baltimore’s putrid rushing attack, either: I was going to try to be nice, but the Ravens’ running game makes it tough. On first-and-10 this year, Baltimore is averaging 3.14 yards per carry, the worst rate in football. (The best? Oakland at 5.39 yards per carry, notably bumped to the top by Pryor’s 93-yard touchdown run on the opening play of the game against the Steelers.) Baltimore has three carries for 20 yards or more this season, a figure that only the Giants (one) have failed to match. (To continue parenthetical asides about the Raiders, they have a league-leading 15 such carries, eight of which came from Pryor; only Alfred Morris, with nine, has more.) Who will be the first person during dessert to make a joke about how Sandra Bullock needs to show up and whip this Baltimore offensive line into shape? It will be your mom, who secretly follows Michael Oher’s career more than you think. Sorry for jinxing you, Ray Rice. 11. David DeCastro’s brand of justice: The Steelers haven’t exactly been their usual selves in terms of the draft these past few years, but DeCastro’s been an interesting case of prematurely declaring a player to be a failure. Expected to be a perennial Pro Bowler after the Steelers took him out of Stanford in the first round of the 2012 draft, DeCastro suffered a major knee injury during the preseason that kept him out for most of his rookie season. When he came back, DeCastro was a shell of his former self. Expected to play better during his sophomore campaign, he looked mediocre during Pittsburgh’s 0-4 start to the season, with an injury to star center Maurkice Pouncey helping turn an expected strength (the interior of the offensive line) into a weakness. Since the bye, though, DeCastro has looked like a different person. Pittsburgh’s offensive line will never be great with the likes of Marcus Gilbert and Kelvin Beachum getting serious reps, but DeCastro has become an anchor for a team that didn’t have one up front. The effects aren’t obvious yet — Le’Veon Bell hasn’t exactly been the back Steelers fans were hoping for so far, averaging a Rice-esque 3.2 yards per carry on his 143 rushing attempts — but the Pittsburgh right guard is worth watching for a handful of snaps on Thursday night. 12. A would-be playoff game on Thursday night: The Steelers and Ravens have had some fun games in the national spotlight over the past few seasons, and while the likes of Joey Porter and Ray Lewis have given way to the more milquetoast attitudes of Flacco and Troy Polamalu, there’s a ton to play for here. The Steelers, for one, can take an enormous leap toward claiming a postseason spot by winning in Baltimore. Pittsburgh’s fourth straight win would take them to .500, which seemed impossible after starting the year with an 0-4 run in September. Their last three wins have been by a combined 39 points and included a victory over the likely playoff-bound Lions, so there’s reason to think they’re actually playing pretty decent football. And, while they still have to play the Bengals and Packers, three of their final four games are at home. A victory over the Ravens would give them a sweep over their archrival and a key tiebreaker in their hunt for a playoff spot. Baltimore might be a little more desperate for a win. Their two wins this year by more than eight points have come against the Texans and, last week, against the Jets. Both of those games were closer than the score indicated. Their schedule after this game is tough: They get two games at home and have matchups against the Lions, Patriots, and Bengals to close out the season, which makes this Steelers game close to a must-win. If the Ravens do win, they’ll have a very generous run of tiebreaker advantages against the competition for a playoff berth: They would have split against the Steelers and likely win on the subsequent tiebreakers, and they have already beaten the Bengals, Jets, and Dolphins, without any losses to teams likely to be in the hunt for the AFC North or the sixth seed besides that Week 7 loss to Pittsburgh. Because the Steelers have played slightly better and have an easier schedule after Thursday night, Football Outsiders estimates that Pittsburgh’s chances of making the playoffs are at 38 percent, well ahead of Baltimore’s 15.9 percent shot at winning. Whoever wins here becomes the clear favorite to claim the sixth and final berth in the AFC playoffs, a place from which the Steelers won the Super Bowl in 2005. It might not be a pretty game, but Steelers-Ravens XXXIX should be a fun, meaningful one tomorrow night.